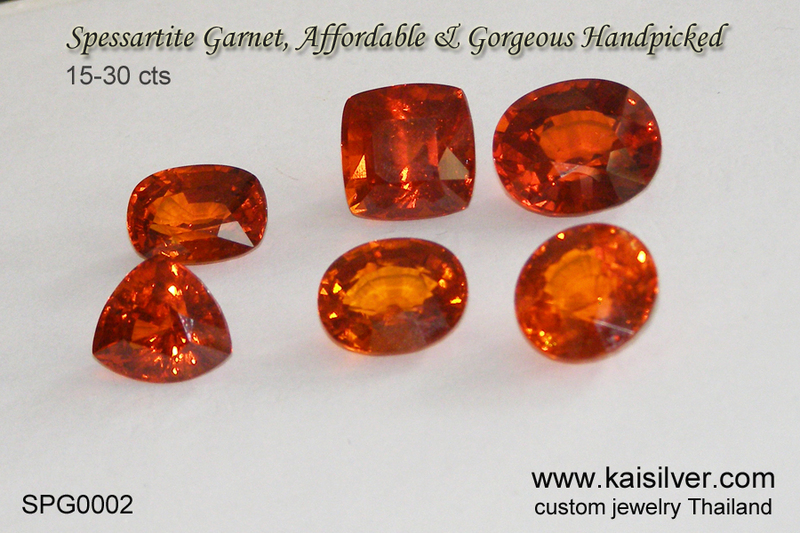 One of the rarer varieties of garnet, spessartite or spessartine garnet as is it often called, has an orange to reddish orange color. This color of this gem when it is very orange is often referred to as 'fanta color' spessartite. We leave color selection to personal preference but, here are some of our random thoughts. Orange and a slightly reddish tint in the orange brings out the richest look of spessartine garnet. The degree of red that shows in spessartite is influenced by just much almandine (red garnet) forms a component of the spessartite. At one extreme you will see that pure orange color and at the other, is a spessartine gem that is so red that it resembles the well known red garnet gemstone. The interesting thing about the very red variety of spessartite is that, an untrained eye could easily mistake it for red garnet. Some buyers wonder why they should pay the higher price of spessartite for a gem, that looks quite similar to the modestly priced red garnet. It is not tough to understand their view point but, opinions can vary from person to person. It has always been the African nations that kept the gems and jewelry markets amazed with this orange garnet. At present, you might hear of Mozambique, Madagascar and Tanzania as sources for spessartite garnets. Sizes typically range from 1 to 4 carats but, expect to see visible inclusions and fissures. For moderate budgets we would suggest that more emphasis be given to, size, cut and color when choosing spessartine. We have not seen many gem reports making the comparison that we are just about to make but, we do feel that it is a good way of explaining the clarity issue related to spessartite. When you talk about white diamonds one of the important benchmarks to gauge value is clarity, terms like eye clean, 10X loupe clean, slightly included etc gain importance. But shift the topic to colored diamonds and top importance is given to color, a compromise in clarity is generally accepted. Keep this in mind when you wish to own rare and expensive gems like spessartite unless, you happen to have a particularly strong budget! A rare orange to reddish-orange variety of garnet. Referred to as spessartite or spessartine garnet. Often found with visible inclusions and fissures. Sturdy enough for frequent wear, hardness 7-7.5. Recommend that red not overpower the orange hue. Very red spessartite gems can be confused with red garnet. Natural and untreated gemstone, canrequest for certification. 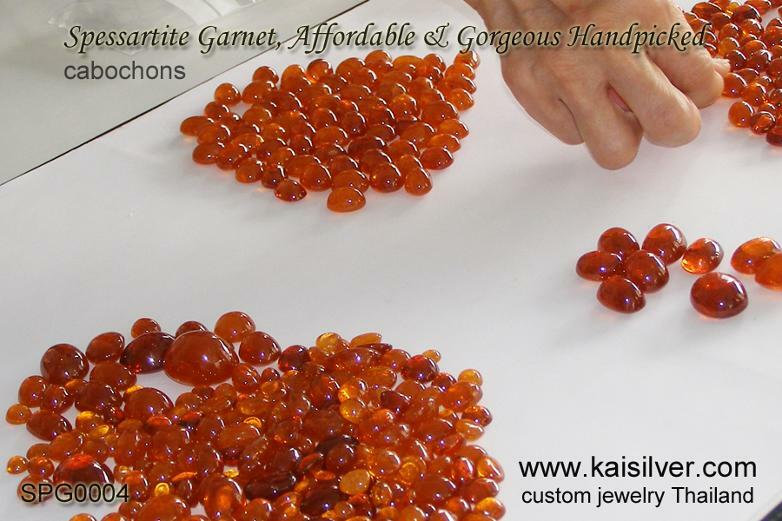 Exclusive large handpicked spessartite gems available with Kaisilver. We can provide matching sets in all sizes and shapes. Through the rest of this report, we will talk about a few handpicked spessartite garnet gems that have come to us at Kaisilver. Since our gem sourcing is done directly from the miners and main manufacturers, we can procure just about any gem for you. This obviously means that, you can always contact us at sales@kaisilver.com for any gem or jewelry requirements that you might have. With a full fledged gem cutting facility always at our service, we will have no problem in custom cutting even a single gemstone for you. An amazing collection of spessartite garnet gems, these gorgeous gems range in size from 3 to 5 carats and do show a red tint in the orange. Have a look at the dark red gem on the top left side of the image, the size of this big spessartite gemstone is truly stunning but, you could easily mistake the gem for a regular red garnet. Many spessartite manufacturers prefer to work with spessartite rough that yields an orange to moderately reddish orange color. Our spessartite stock has been sorted by our experts with decades of gem sorting experience, inclusions in the gems can be rated as scarce to significant. As you would very likely be aware, the price per carat of this orange garnet will move up steeply as the degree of visible inclusions in the gem decreases. 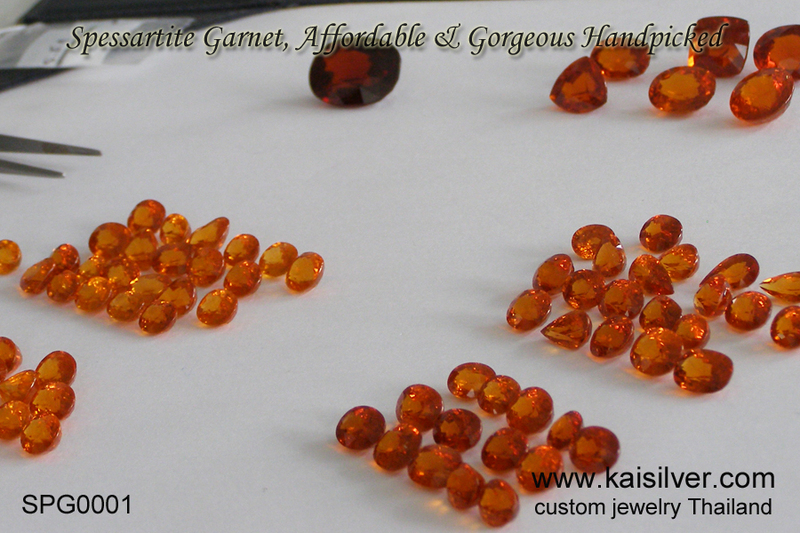 If you just wondered where all the big spessartite garnet gems had gone, talk to us at Kaisilver. A generous weight of 15-30 carats for these rare and exclusive spessartine gems. We might be able to fullfill requests for large spessartine gemstones in the 30 to 50 carat size range too. Here is something that you should keep in mind when choosing such large spessartite gemstones. Firstly getting absolutely loupe clean or even eye clean gems in this carat weight is tough and even if we do source them, expect the price to be at least around two to three times of what this gem size would normally cost. Take a lesson in selecting colored diamonds and follow a more logical process. Large spessartite gems with a more saturated color, if well cut, shaped and faceted will draw attention to the sparkling beauty of the gem - this will soften the appearance of the inclusions and fissures in the stone. The very big jewelry houses that are generally affordable only to those who have red carpet experience, have another trick up their sleeve. Believe us we have noticed this happen quite frequently. When they come across a tremendous gem that is worth many thousand dollars but, bestowed with a blemish - effort is made to alter the design elements of the jewel in such a way that, the blemish is covered up in an innovative way. They might just add another metal element that, embraces the gem in a strategic position that, covers up the blemish. That metal element might then be, studded with diamonds that ooze brilliance and fire. We at Kaisilver can create such designs too so let us know if you would accept such a process. The recent increase in the demand for cabochon gems is gaining momentum. Even seasoned jewelry lovers have come to appreciate the simple elegance of these smooth gems. We have a nice collection of cabochon spessartite gemstones, big sizes that can go as high as 60 carats. In the absence of distractions like facets and angles, these big spessartine cabs allow light to softly bounce back from the surface and soothe the eye with a sublime luster. The eye refuses to be disturbed by the inclusions and fissures inside the stone. By understanding the mind and eyesight of humans, gem manufacturers offer cabochon gems realizing that, the buyer experiences the beauty of the gem at a more affordable price point. You can let us know if you wish to have any of these (or other) spessartine cabochon gems. They can be set in a custom jewel crafted by Kai Silver for you. Giving us an idea of your budget will let us, come up with relevant suggestions. A better idea of the general color range of our cabochon cut spessartite gemstones, can be had by viewing the gems in the image marked SPG0004. You can pick the color that you prefer for your cabochon gem and email us your requirements. 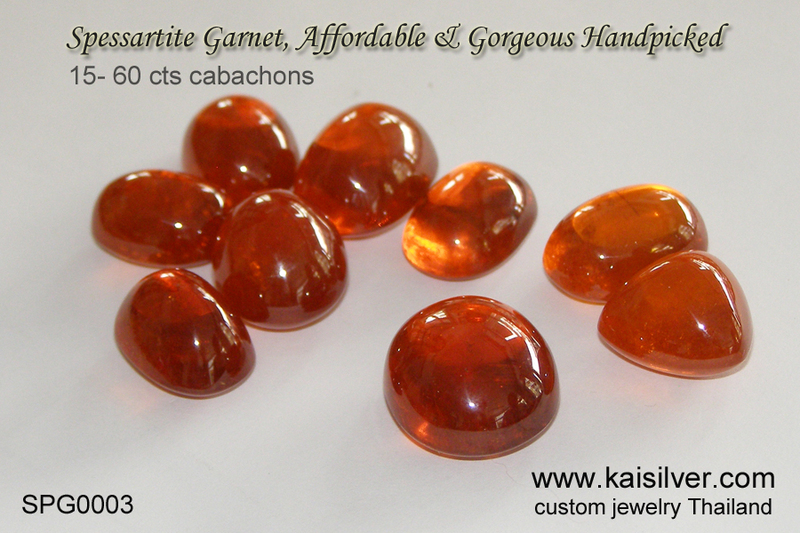 A general view of the amazing cabochon spessartine gems that we offer, color ranges from lighter orange to more reddish orange colors. Our experts will handpick a piece for you based on your details of color preference and carat weight. The price will vary according to the degree of clarity but as suggested before, keep the focus on color and size and then work within your budget to get the best gemstone. These cabochon spessartite gems are in the 6 to 60 carat range, they get rarer as the size moves up, the price will reflect this. We can pick a gorgeous set to make a stunning spessartite ring, pendant and earrings for you, so discuss your requirements with the Kai Silver team. Birthstone: So is spessartite garnet a birthstone, here is our answer. When garnets were first discovered by man, it was presumed that all garnets are red. If you go back to times when gems were identified solely by color you will understand why, the Biblical term 'carbuncle' clubbed two red gems, ruby and garnet together. Garnet is assigned to be the birthstone for the month of January and a conservative opinion would say that, only red garnets were implied. People honestly believed at that time that, garnets would never be found in a color besides red but, science has proved that notion to be wrong. We today know that green, orange, yellow and brown are some other colors that garnets can boast of. In our opinion a more liberal opinion should be taken and garnet, in all colors should do equally well as January birthstones. Kaisilver: Rated as the leading online custom made jewelry provider, we specialize in high end jewelry and place no restriction on design and gemstones. Besides having direct access to over 200 million carats of cut and polished gems, we also work directly with almost all mining operations across the globe. A team that consists of seasoned gem experts, talented designers and handpicked artisans from Thailand's jewelry industry, works on all our jewelry orders. We provide the same quality of workmanship and gems for both gold and 925 silver jewelry. Leading gem manufacturers often reserve the best of their output for our review. With a large base of quality conscious gem and jewelry clients all around the world, we remain the preferred source for fine custom jewelry. Contact us at sales@kaisilver.com with any questions or requirements that you might have. We also welcome your own design images to be custom made.